The night was incredibly beautiful and serene. The full moon splashed a ribbon of silver across the mirrored surface of the Buffalo River. The sky glittered with a million stars. A cool breeze carried the evergreen fragrance of a nearby cedar glade and the ghostly songs of two lovesick screech owls. Along the water’s edge, shining in the mud, we could see the yellow-green tail lights of thousands of glow worms, the larvae of lightning bugs. They seemed a reflection of the starlight above, as out of place in the umber earth as emeralds in a sandbox. In the crystalline water beneath us were more of nature’s beauties—long, lean fish cast of gleaming bronze. It was these smallmouth bass for which we’d come. But finding ourselves continually distracted by the exquisite scenery, my fishing partner, Glenn Wheeler, and I found it difficult to focus on fishing. Fortunately, the lures we used did not require concentration. We were casting Arbogast Jitterbugs, big topwater plugs that have been part of the Ozarks fishing scene for more than 70 years. And lucky for us, Jitterbugs are the ultimate auto-pilot lures. It was back in the early 1930s the Jitterbug came to be. Lure designer Fred Arbogast and one of his employees, Brook Oertel, were trying to make a new deep-running crankbait. They started by mounting a cupped lip on the top edge of a wooden lure body. But during tests, instead of diving as they had hoped, the plug would turn sideways and then angle toward the surface. No matter how many adjustments they made, their new creation misbehaved. Eventually, Arbogast decided to capitalize on the lure’s propensity for surfacing. He repositioned the lip on the bottom, fine-tuned it, and the Arbogast Jitterbug was born. Introduced in 1938, this wobbling, noise-making surface plug became one of the most popular bass-fishing lures of all time, with an average of three quarters of a million sold annually well into the 1980s. The Jitterbug is still being manufactured and still catches bass—largely because it is so simple and easy to use. Throw it out and reel it in; that’s all there is to it. As it gurgles across the water, making its distinctive plop, plop, plop sound, the Jitterbug inveigles hungry bass like a duck call attracts mallards. 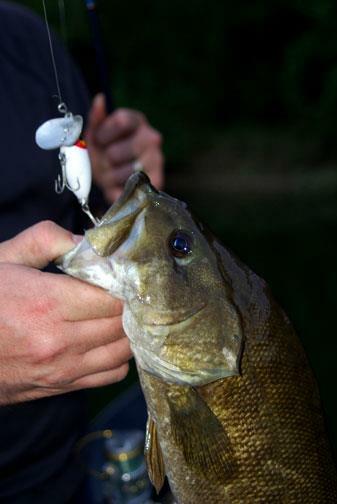 Smallmouth bass have been targeted by Ozark anglers since the earliest settlers arrived. When the Jitterbug debuted, it instantly found favor with these common-sense mountain folks. If you find something that works, stick with it, they say. And the Jitterbug works, as generations of Buffalo River anglers will attest. Glenn Wheeler of Harrison grew up in a small community near the Buffalo and says Jitterbugging has a long tradition here. As we drifted through the moonlit Buffalo River backcountry, Glenn proved he’s pretty good at Jitterbugging, too. As his lure gurgled across the surface, it left an easily seen bubble trail. I had my eyes on this when a bass exploded beneath Glenn’s lure. I was anticipating the strike, but even so, its violence unnerved me. The water erupted like Old Faithful, and Glenn set the hook with a hard, upward sweep of his rod tip. This sent the smallmouth airborne. It cartwheeled across the surface and plopped back in with a raucous belly flop. Then it jumped again—once, twice, three times. I thought the bass might throw the hook, but Glenn played the fish artfully and soon had it in the boat. The 3-pounder was the first of many smallmouths we would land that night. He’s right. Many anglers say the powerful, acrobatic smallmouth is the ultimate North American gamefish. And catching these bruisers in America’s first national river is a special treat. The scenery is, in a word, spectacular. For 150 miles, from its headwaters near Boxley to its junction with the White River near Buffalo City, the Buffalo offers an unmatched mix of clear water, lofty cliffs, overhanging hardwoods and inviting gravel bars. Some of the many float stretches to check out are the Ponca to Highway 7 float (25 miles with access points and campgrounds at Steel Creek, Kyles Landing, Erbie and Ozark); the stretch between Arkansas Highways 7 and 123 (10 miles with accesses and campsites at Carver and Hasty); the float from Arkansas 123 to U.S. Highway 65 (32 miles with access/camping areas at Mount Hershey and Woolum); the U.S. 65 to Buffalo Point float (27 miles with access points at Gilbert, Maumee North, Maumee South and Arkansas Highway 14); and the final stretch from Buffalo Point to Buffalo City (30 miles with a single take-out point at Rush). Just as the sun was rising, Glenn and I caught up with the other four anglers in our party—Jim Spencer of Calico Rock, Stephen Matt of Eureka Springs, Lawrence Taylor of Fort Smith and Wade Bourne of Clarksville, Tennessee. Fishing downstream from us in two johnboats, they, too, had caught some nice smallmouths on Jitterbugs. We pitched a tent on a gravel bar and built a campfire. Then all of us kicked back to relax.